The ongoing argument about the benefits of moderate consumption of wine and other beverage alcohol as part of a healthy lifestyle continued in 2018. The country’s Puritan heritage has caused a conflicted attitude about wine and has led us to seek justification for drinking wine beyond its gustatory and social pleasures. The results of a myriad of observational research studies published in 2018 were often sensationalized by the lay press and only served to confuse the public. A review of 64 of the most shared media articles pertaining to 50 academic articles that appeared in the peer-reviewed science journal PLOS One in May 2018 found that health news stories often overstate the evidence from a new study, and 58 percent of media articles inaccurately reported the question, results, intervention or population of the academic study, as well as incorrectly attributing causal relationships. The chart below from that publication compares the strength of causal inference in academic studies with the strength of causal language in media articles. The public is thoroughly confused and I am exasperated. As a medical doctor, I read much of the medical literature and research on the relationship between alcoholic beverages and health, yet I cannot arrive at a clear vision of the relationship. Practically every published research study ends with the disclaimers such as, “Further study is necessary,” “More research is needed to explain the results,” and “The results may be explained by biases and confounding.” The word, “suggestive,” or the two words, “interpret cautiously” are often employed. A Gallop poll published in 2018 asked consumers if they considered drinking in moderation (one or two drinks a day) was good for their health. 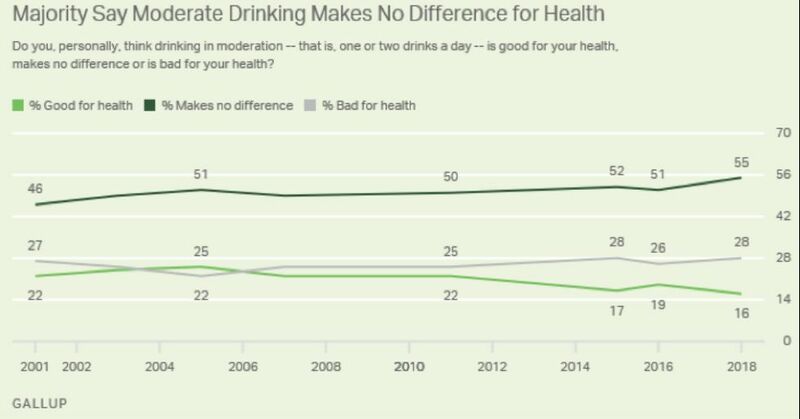 The results over a 17-year period indicate the public is still conflicted about the possible health benefits of moderate drinking. More consumers now believe moderate drinking has no health benefit and fewer trust that it is good for their health. Much of the uncertainty surrounding the health benefits of moderate drinking stems from the fact that scientific research to date has been performed either in vitro on lower life forms (rats, yeasts, worms) or in vivo with cohort and case-control analyses. There have been no well-executed, randomized, double-blinded, intervention trials controlled for all confounding variables. A comprehensive randomized study is impractical because it requires documenting long-term behavior over decades and represents a real perceived risk of harmful effects. Still, it is apparent to researchers that well-performed observational studies can establish a high probability of causality in these data.” Valuable critiques of currently published scientific papers is available to the public by members of the International Scientific Forum on Alcohol Research (ISFAR), a joint undertaking by the Institute on Lifestyle and Health of the Boston University School of Medicine and Alcohol in Moderation (AIM) organization of the United Kingdom. ISFAR consists of an international panel of invited physicians and scientists who are specialists in their fields and committed to unbiased, balanced and well-researched analyses regarding alcohol and health. All reviews and publications of ISFAR’s work are on a volunteer basis and ISFAR has had no financial support from the beverage industry or related organizations for the past 3 or 4 years. ISFAR, through its open website at www.alcoholresearchforum.org, and AIM through its Alcohol in Moderation Digest Online at www.aim-digest.com, study summaries, timely critiques and comments on emerging scientific publications and policy statements related to alcohol and health. ISFAR and AIM provide an opportunity for all to seek expert opinion on topics related to alcohol and health. In 2018, I reviewed all the major scientific publications related to alcohol and health, many lay press articles, and multiple ISFAR critiques, and tried to arrive at some well-established facts regarding the health benefits of wine and other alcoholic beverages that reflect the current opinion of a majority of the scientific community. In addition, some of the views offered below were derived from the research and opinion of Arthur L. Klatsky MD, a highly respected researcher in the alcohol and health field. My intention in presenting this scientific-based information is to dispel some of the growing and irresponsible negative press about drinking in moderation as part of a healthy lifestyle. 1. Alcohol research is complicated by confounding. For example, non-drinkers may not drink because of health problems and this can cause a misleading impression of cause and effect. Many research studies now attempt to control for confounding variables. 2. A common criticism of studies that show health benefits for moderate alcohol consumption is that “sick quitters” (those that gave up alcohol) can skew the apparent benefits of moderate drinking. Some newer studies are designed to exclude sick quitters from abstainers. 3. The website of the National Institutes of Health (NIH) in the U.S. states that moderate consumption of alcohol (one drink a day for women and two for men) may have beneficial effects on health, including reducing the risk of heart disease stroke and diabetes. 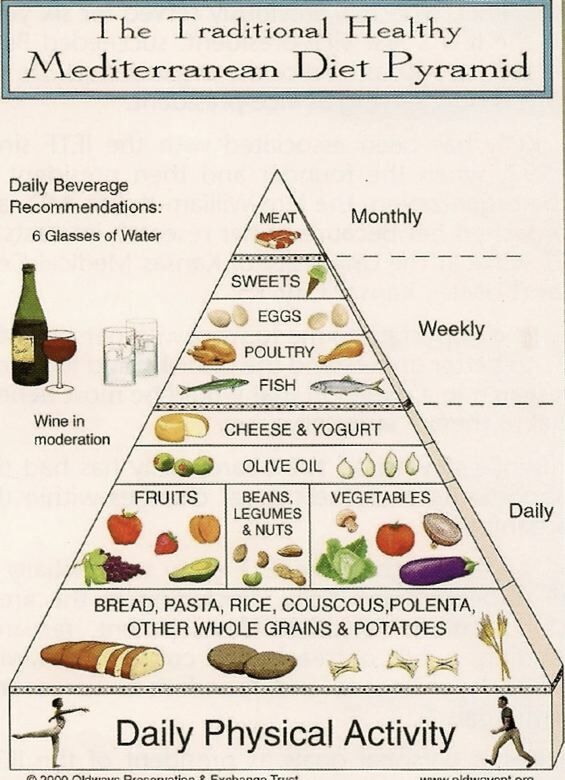 This is in line with the widely accepted recommendation of one glass of red wine a day for women and up to two glasses of red wine daily for men, assuming there are no medical contraindications (individual ideals may vary). 4. There is absolutely no added benefit to drinking more than moderate amounts of wine daily. 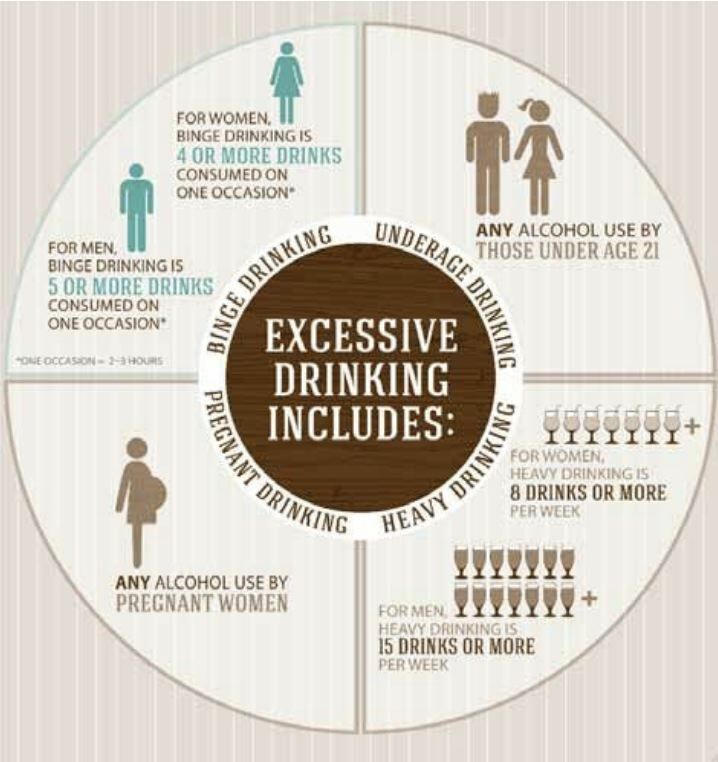 Heavy drinking or binge drinking is associated with negative health consequences. 5. Low to moderate alcohol consumption for adult or old people has been linked with potential health benefits including decreased risk of coronary heart disease and mortality, protection against congestive heart failure, decreased risk of ischemic stroke, and protection against type 2 diabetes, rheumatoid arthritis, cognitive impairment, dementia and Parkinson’s disease. The exact physiological explanation behind these associations is not fully understood. 6. Moderate alcohol consumption does not outweigh the possible heart-related benefits in young men because of the increased risk of alcohol-related accidents. For young women, there is a low risk of cardiovascular disease, so that the risk of moderate drinking exceeds the benefits. If you wish further detailed information about the most significant 2018 research in the alcohol and health field, read the subsequent sections of this issue. 7. The cardiovascular benefits of moderate alcohol consumption increase with age so that a 60-year-old man who drinks one drink a day can expect that the protection afforded against heart disease is likely to outweigh the potential harm. A 60-year-old woman is more likely to die from heart disease than breast cancer (woman suffer just over half of all fatal heart attacks), so the benefits of light to moderate consumption outweigh the risks, although women are often more afraid of breast cancer. 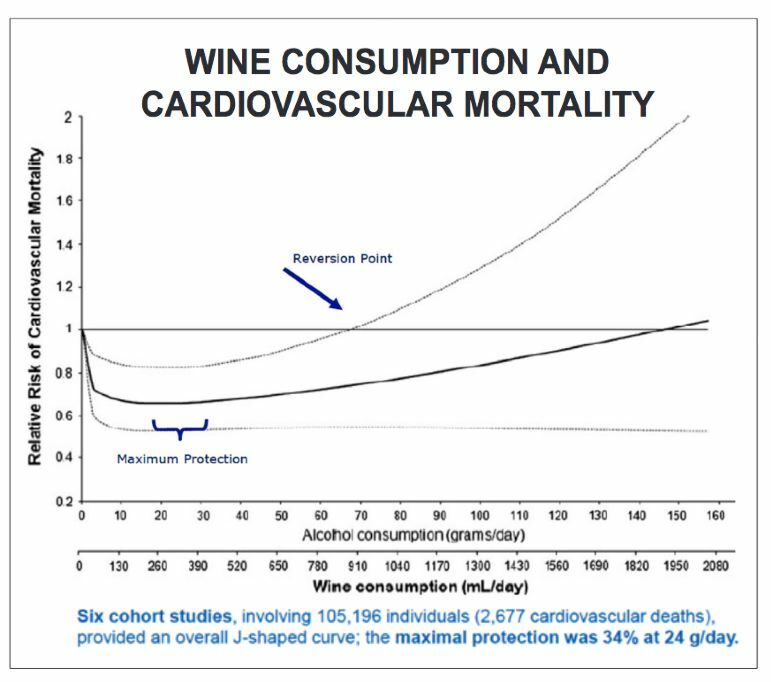 In other words, mature adults benefit potentially the most from light to moderate alcohol consumption, and the reduced risk of cardiovascular disease and mortality clearly outweighs possible cancer or other disease risks, as demonstrated by the J-shaped curve. 8. A safe level of alcohol during pregnancy has not been determined and many medical organizations including the Centers for Disease Control (CDC) recommend women should avoid drinking completely during pregnancy or pre-pregnancy if they are not using birth control and there is any chance they might be pregnant. 9. For most cancers, there is a dose-response curve in that risk increases with the more alcohol that is consumed on a regular basis. Epidemiological evidence is strong for an association of chronic heavy alcohol consumption with cancers of the oral cavity, pharynx, larynx, esophagus and liver. There is a fairly consistent association of heavier alcohol consumption with female breast cancer, but there is considerable debate about the presence and level of a risk threshold. The data on many other cancer types is inconclusive. Wine does not appear to be a healthier drink from the standpoint of cancer risk. 10.The health benefits from alcohol and in particular red wine are only obtainable through regular and moderate consumption. Wine consumed with a meal may be healthier as drinking wine increases cardioprotective effects, aids digestion (the pH of wine is close to that of stomach acid), decreases food-borne pathogens, and may help diabetics metabolize sugars and starches. 11.Red wine is possibly healthier than other alcohol beverages because of its polyphenol content. 12.Your physician should always be consulted before altering your alcohol consumption habits. Medical professionals do not advise abstainers to begin drinking for health reasons. 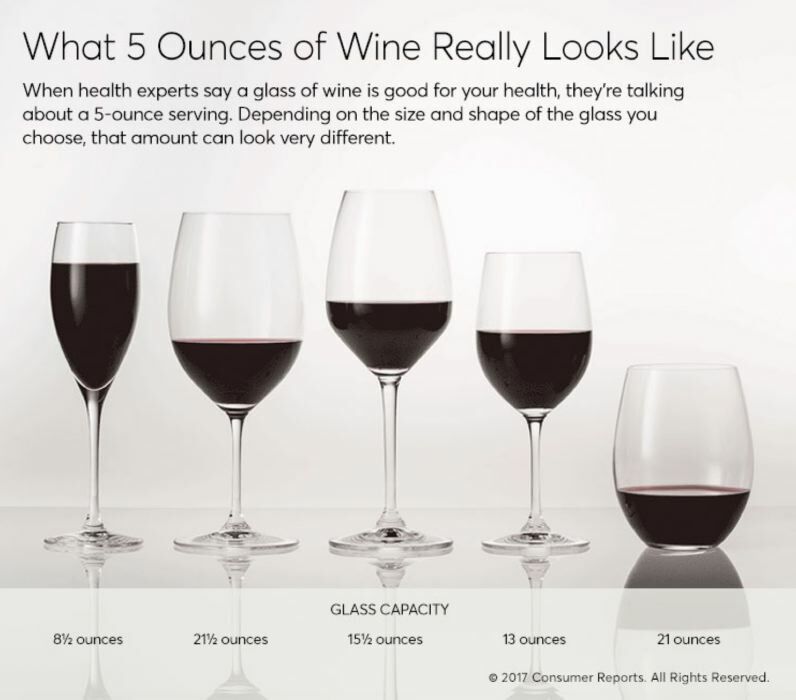 To understand “moderate drinking,” and the standard drink size referenced in this issue, a few definitions are in order. 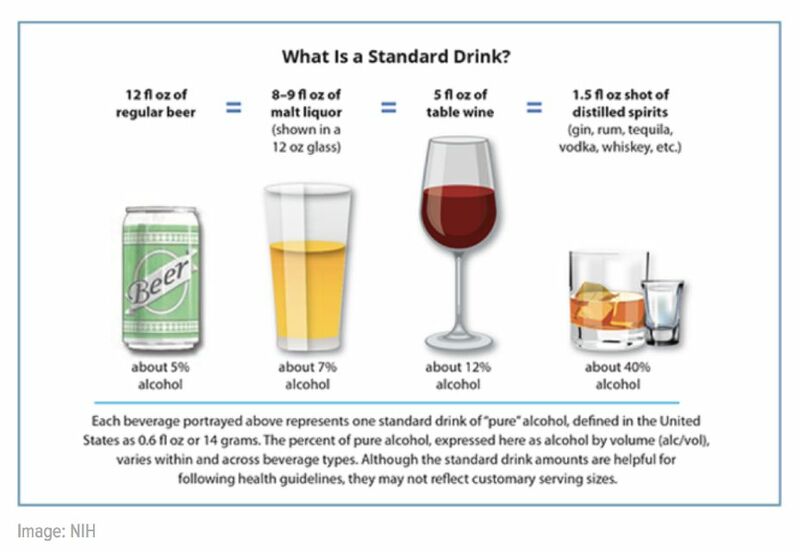 In the U.S., a standard drink or unit contains 17.7 ml or 14 gm or 0.6 ounces of ethanol which is equivalent to 12 ounces of about 5% alcohol by volume beer, 5 ounces of 12% alcohol by volume wine and a shot (1.5 ounces) of 80-proof or 40% alcohol by volume distilled spirits or liquor. A full bottle of wine contains 750 ml or 25 ounces which is 5 to 7 standard drinks depending on the alcohol percentage. A bottle of 16% alcohol wine will have about 1 more drink than a bottle of 13% alcohol, the point being that alcohol percentage does make a difference when you are looking to drink in moderation. One would want to scale back the volume of drinking when imbibing a wine with a higher alcohol percentage. As an informed physician, I am with the majority of health experts who are confident that wine in moderation is good for you, especially for middle-age to older people. If nothing else, it provides gustatory pleasure and relaxation. There is no optimal level of alcohol consumption. My prescription is 5 ounces of wine (one standard drink) for women and up to 10 ounces of wine (two standard drinks) for men, preferably red and Pinot Noir, to be enjoyed most days and consumed with food. That said, wine drinking may not be advisable for everyone, and one should consult with their doctor about the effects of wine consumption on their health as well as lifestyle and diet advice, and choose a personalized course. Those under 21 years of age should not consume alcohol. The International Meeting on Alcohol and Global Health was held September 25, 2018 in Leuven, Belgium. Important studies by professors and scientists from across Europe reported at this meeting were published in the October 2018 AIM Digest. Professor Giovanni de Gaetano from Italy presented a talk on the J-shaped curve that is often used to describe the relationship between alcohol consumption and total mortality. 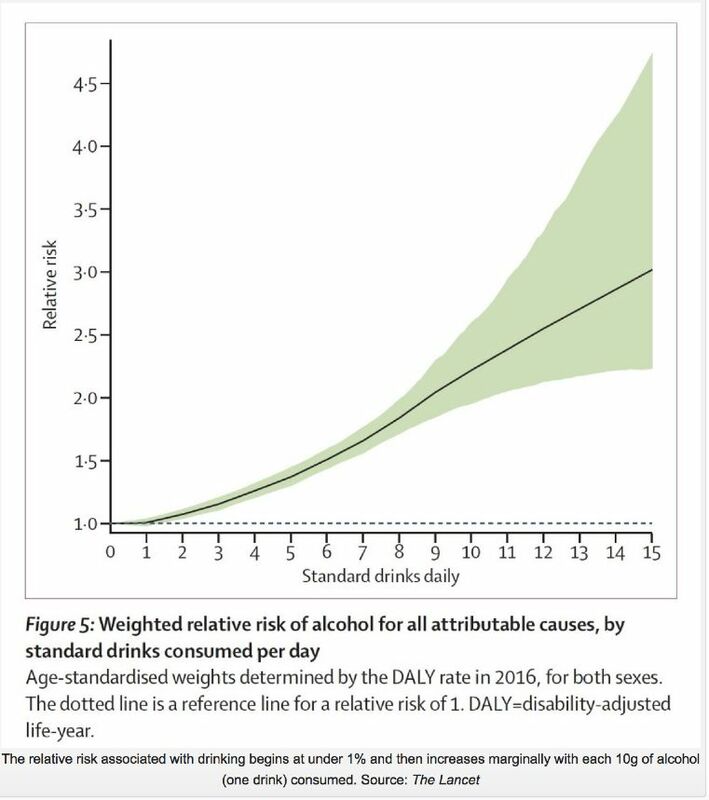 As the chart below demonstrates, 1-2 drinks a day or light-to-moderate drinking represents optimum exposure to alcohol while the increased risk in life-long drinkers or heavy drinkers reflects the consequence of sub-optimal exposure. Professor Gaetano pointed out that the pattern of drinking is important. A drink a day with food is protective while a similar amount on one or two occasions negates the J-shaped curve. When excluding the effect of confounding factors such as diet, lifestyle and socioeconomic status, the J-shaped curve has been demonstrated in multiple studies over the past twenty years. The J-shaped curve has also been verified for cardiovascular disease. The benefits of drinking shown by J-shaped curves apply mainly to men over 40 and postmenopausal women when the risk for heart disease increases. A very important study appeared in July 2018 in PLOS Medicine affirming the J-shaped curve for mortality. 99,654 adults aged 55-74 participating in the United States Prostate, Lung, Colorectal and Ovarian (PLC) Cancer Screening Trial were studied. The IFSAR critique indicated that this was a well-done analysis and showed essentially for the first time in a single study how the beneficial effects of light and moderate drinking on cardiovascular disease and total mortality exceed the slight increase in cancer risk for alcohol consumption at this level. In other words, while even light-to-moderate drinking may be associated with a slight increase in the risk of certain cancers, such drinking still favorably affects the overall risk of mortality in older adults. The results indicated that intakes below 1 drink per day were associated with the lowest risk of death. An analysis using data from the Nurses’ Health Study (1980-2014) and the Health Professionals Follow-up Study (1986-2014) was published in the journal Circulation in April 2018. Five low-risk factors were studied including never smoking, body mass index of 18.5-24.9 kg/m2, greater or equal to 30 minutes of daily moderate to vigorous physical activity, moderate alcohol intake, and a high diet quality score (upper 40%). The projected life expectancy at age 50 among female Americans with all 5 low-risk factors was 14.0 years longer compared with those with zero low-risk factors, and for men, the difference was 12.2 years. This study confirms the results of many other cohort observational studies that conclude that adopting a healthy lifestyle including moderate alcohol consumption could substantially reduce premature mortality and prolong life expectancy in U.S. adults. 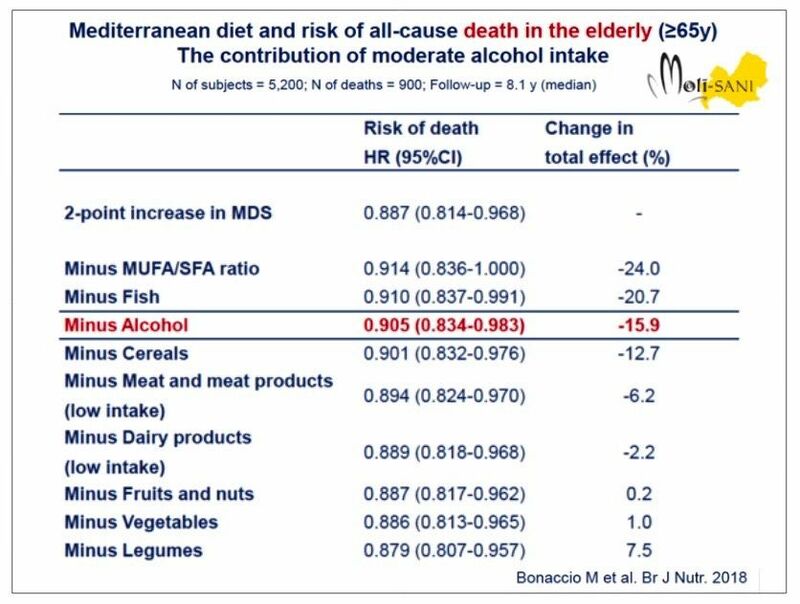 A prospective cohort study and meta-analysis published in the British Journal of Nutrition in October 2018 showed that closer adherence to the Mediterranean diet (MD) was associated with prolonged survival in elderly individuals equal to or greater than 65 years. This suggests the appropriateness for the older person to adopt or continue the MD to maximize their prospects for survival. If alcohol is removed from the MD, the protective effect is reduced by 15%. The 90+ Study at the University of California Irvine Institute for Memory Impairments and Neurological Disorders (UCI MIND) has followed 1,600 elderly adults since 2003 through twice-yearly evaluations. Consuming two glasses of wine or beer per day was associated with a 15 percent reduced risk of premature death compared to abstainers. Regular exercise, social and cognitive engagement, moderate coffee consumption, having a hobby, and being overweight in the 70s also led to a longer lifespan. This study and another study on “Super Agers” that looked at people in their 80s were presented at the American Association for the Advancement of Science in February 2018. The conclusion was that those who drank a couple of glasses of wine or beer a day were more likely to live longer compared to abstainers. According to a study from the American Heart Association released in January 2019, nearly half or 121.5 million Americans dealt with heart or blood vessels disease as of 2016. The study noted that death from cardiovascular disease (CVD) is the number one killer of all Americans, women as well as men, rising from more than 836,000 in 2015 to more than 840,000 in 2016. CVD is also the leading cause of death globally. CVD is comprised of coronary heart disease, heart failure, stroke and a high blood pressure reading now defined by the American Heart Association as a reading of 130/80 mm Hg, an increase from the previous definition of 140/90 mm Hg. Over 20 years of research has shown that for many people, moderate consumption of alcohol can protect the heart but the reason for this is still unclear. Studies to date have not proven that alcohol or polyphenols in wine such as resveratrol, quercetin and ellagic acid are most important for cardiovascular health benefits. In 2018, the National Institute on Alcohol Abuse and Alcoholism (NIAAA), part of the National Institutes of Health (NIH) began a 10-year, $100 million dollars Moderate Alcohol and Cardiovascular Health (MACH) trial that was aimed at removing the debate on whether drinking lowers the rate of heart disease. The plan was to study 7,800 participants older than 50 living on multiple continents, of both sexes, and who were at risk for CVD. Heavy drinkers were excluded. The controlled study assigned participants to two groups: one group was to consume one alcoholic drink every day for six years and one group was to abstain from alcohol every day for six years. The study was halted on June 15, 2018, because it was revealed that funding for the study came from the alcohol industry through the nonprofit Foundation for the NIH. There were also a number of criticisms of the design of the study, including too short a period of study, not enough enrolled participants and the exclusion of women at high risk for breast cancer. An analysis of Norwegian population-based health surveys published in PLOS Medicine in January 2018 found that moderately frequent alcohol consumption, that is, 2-3 times per week, was associated with a lower risk of CVD compared to those who infrequently consumed alcohol (less than once per month). The benefit was more pronounced among those with a higher socioeconomic position. Very frequent drinking (4-7 times per week) was associated with a higher risk of death from CVD but only among those with a low socioeconomic position, presumably because of lifestyle differences. Those in the middle and high socioeconomic categories were not at higher risk. Binge drinking was associated with an increased risk of CVD in all groups regardless of socioeconomic position. Researchers at the University of Athens and Harokopio University in Athens reported in the journal Metabolism in June 2018 a meta-analysis of 76 past scientific reports about wine’s acute and long-term health effects. This study suggested that increased levels of high-density lipoprotein (HDL) or “good cholesterol,” was due mainly to ethanol found in any type of alcoholic beverage, not just wine. The body’s blood clotting system was positively affected by wine’s micro-constituents that decrease platelet aggregation, and by alcohol in general by lowering levels of fibrinogen. The study’s authors concluded that wine appears to have a positive effect on cardiovascular health but the exact sources of these benefits, that is alcohol or polyphenols or otherwise, could not be determined and more controlled studies are needed. participants older than 55. The researchers concluded that the findings supported the notion of a cardioprotective effect of moderate alcohol intake relative to non-drinking, but the consistency of alcohol consumption over time appeared to be an important modifier of this association. The six studies reviewed were observational so the results do not prove the direct effects of drinking patterns on CVD. Researchers from Harvard and Italy reported on the prospective results from the Moli-sani cohort study of an adult Italian population in the Addiction Journal in December 2018. The authors of the study looked at the relationship between alcohol consumption and the risk of hospitalization and found that those who consumed roughly one drink per day endured fewer hospital visits compared with those who drank more and those who did not drink at all. Also, those who drank 1-12 grams of alcohol per day had a lower rate of CVD compared to lifetime abstainers and former drinkers. Brazilian researchers in partnership with scientists at Stanford University reported in the journal Cardiovascular Research in June 2018 the results of a study of an ex-vivo model in mice designed to see the role of aldehyde dehydrogenase 2 (ALDH2) in cardioprotection. ALDH2 is a mitochondrial enzyme that neutralizes acetaldehyde, an intermediate product from ethanol digestion. The researchers had previously demonstrated that acute ethanol administration protects the heart from ischemia/reperfusion injury through activation of ALDH2. This study suggests that moderate exposure to ethanol causes minor stress in heart cells but not enough to kill them, intracellular signaling is reorganized as a result, and heart cells eventually create a biochemical memory to protect against stress (preconditioning). 50% of East Asians with the ALDH2 gene mutation cannot properly metabolize ethanol, causing high levels of acetaldehyde and exposing them to maximum heart damage. In those with a normal ADH2 gene, heart damage can be exacerbated if a large amount of alcohol is consumed as in binging since the excessive production of acetaldehyde makes it difficult for ALDH2 to effectively neutralize all of it. In summary, this study suggests that low levels of acetaldehyde are cardioprotective whereas high levels are damaging in an ex-vivo model of ischemic injury, and ALDH2 is a major, but not the only, regulator of cardiac acetaldehyde levels and protection from ischemia. A study reported in the November 2018 issue of the Journal of Biology and Medical Research looked at the clinical evolution of long-term red wine drinkers in relation to coronary artery calcification (CAC). 200 healthy male habitual red wine drinkers were followed and compared to 154 abstainers for a period of 5.5 years. During the follow-up, major adverse cardiac events were significantly lower in drinkers than abstainers, despite higher CAC determined by coronary computed tomography angiography. Greater CAC values in this setting did not predict a worse prognosis. Research has found links between alcohol and certain cancers including mouth, upper throat, esophageal, laryngeal, breast bowel and liver. The risk of developing cancer is directly related to the amount of alcohol imbibed. Smoking along with alcohol produces a significantly greater risk of cancers of the upper airway and digestive tract. At the International Meeting on Alcohol and Global Health in September 2018, Dr Henk Hendricks of The Netherlands discussed the contribution of alcohol consumption to the overall incidence of cancer in the Western world. Among cancer risk factors, alcohol’s contribution is estimated at about 3%. 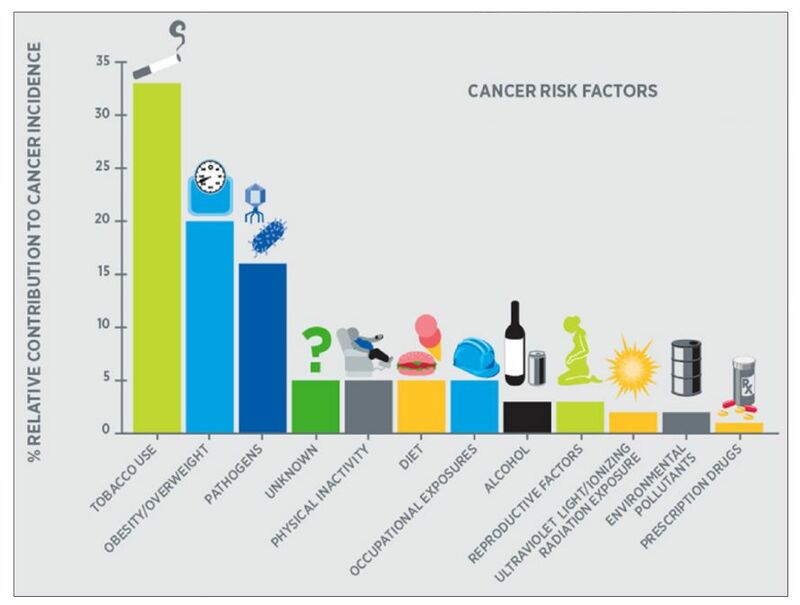 Cancer risk factors are illustrated in the chart below from that study. Low alcohol consumption (up to 15 g/day) may be associated with overall cancer incidence and therefore cancer risk. Higher alcohol consumption (<15 g/day) is associated with an overall increased cancer incidence of 3-8% at 15-30 g/day and 5-19% at 30-50 g/day. Overall cancer risk may increase in women at a daily consumption that is about half that of men. Cancer risk is only increased substantially when drinking 60 g (about 4 standard drinks) or more of alcohol per day. Dr. Hendricks’ analysis suggests that drinking in moderation does not have a substantial impact on overall cancer risk and is less important as a cancer risk compared to lifestyle factors such as smoking and obesity. Hendricks stated that light and moderate alcohol consumption is only associated with breast, prostate, ovarian, gastric and colorectal cancer (there are a number of studies that dispute this association except for breast cancer - see research reports below). 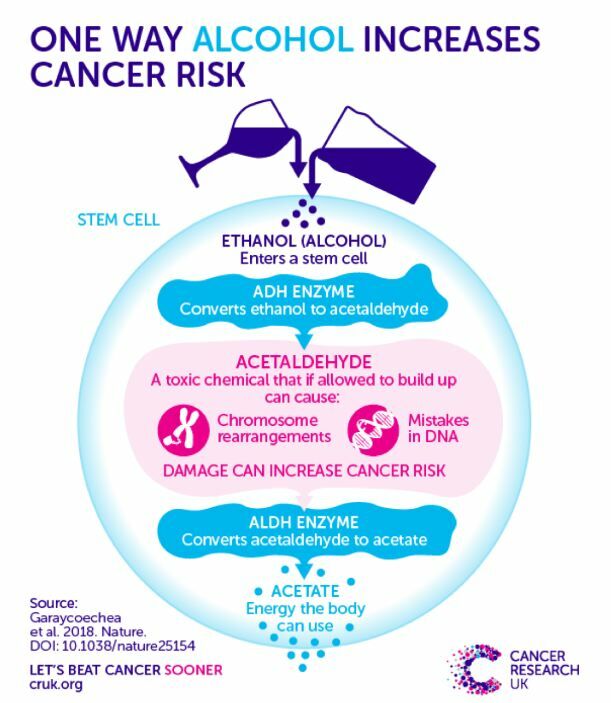 A culprit in the link between alcohol and cancer is likely acetaldehyde, the breakdown product of alcohol metabolism. University of Cambridge researchers reported in Nature in January 2018 that acetaldehyde can damage DNA with the blood stem cells of mice causing mutations that might lead to higher risk. An NIH-AARP large diet and health cohort study published in the International Journal of Cancer in 2018 concluded that alcohol consumption was not associated with the increased risk of gastric cardia adenocarcinoma and gastric non-cardia adenocarcinoma. The ISFAR critique identified potential confounders in this analysis, but reviewers considered the results did support the lack of an association between light-to-moderate alcohol intake and the risk of cancer. The results did not support the fact that wine might have additional benefits over beer and spirits in terms of cancer risk. A European meta-analysis of observational studies published in the European Journal of Cancer Prevention in September 2018 suggested that any wine consumption was not associated with the risk of colorectal cancer in men and women. A recent meta-analysis at the University of Vienna reported in Clinical Epidemiology in 2018 pulled together 17 previous studies covering more than 600,000 men. The results suggested that high levels of antioxidants such as resveratrol in red wine may have a protective effect and reduce the risk of prostate cancer among men by about 12 percent. Drinking white wine appeared to raise the risk by 26 percent. 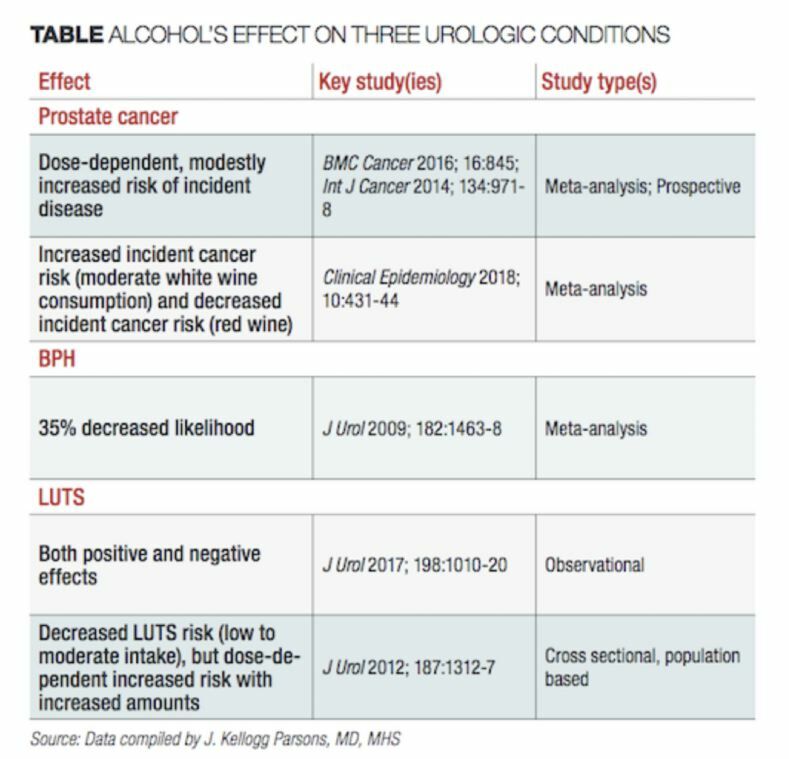 J. Kellogg Parsons MD, writing in Urology Times in September 2018, discussed the effect of moderate alcohol intake on prostate cancer, benign prostatic hypertrophy (BPH) and lower urinary tract symptoms (LUTS). the table below summarizes alcohol’s effect on three urological conditions. For prostate cancer, studies have shown alcohol to be neither beneficial or harmful. Some in-vitro and animal studies suggest that the polyphenol resveratrol has anti-neoplastic activity, but there are no conclusive studies to demonstrate that resveratrol prevents or protects against prostate cancer. The International Agency for Research on Cancer estimates that for every drink consumed daily, the risk of breast cancer goes up 7 percent. More than 100 studies over several decades have reaffirmed the link between alcohol and breast cancer. It is known that acetaldehyde binds to DNA and this may be responsible for mutations that can lead to cancer. Also, alcohol increases estrogen levels and this can prompt faster cell division in the breast leading to mutations and cancer. ISFAR insights into the relation of alcohol to cancer from studies of alcohol and breast cancer are worth attention. “The question of alcohol as a cause of cancer has been widely touted by certain investigators and the lay media. 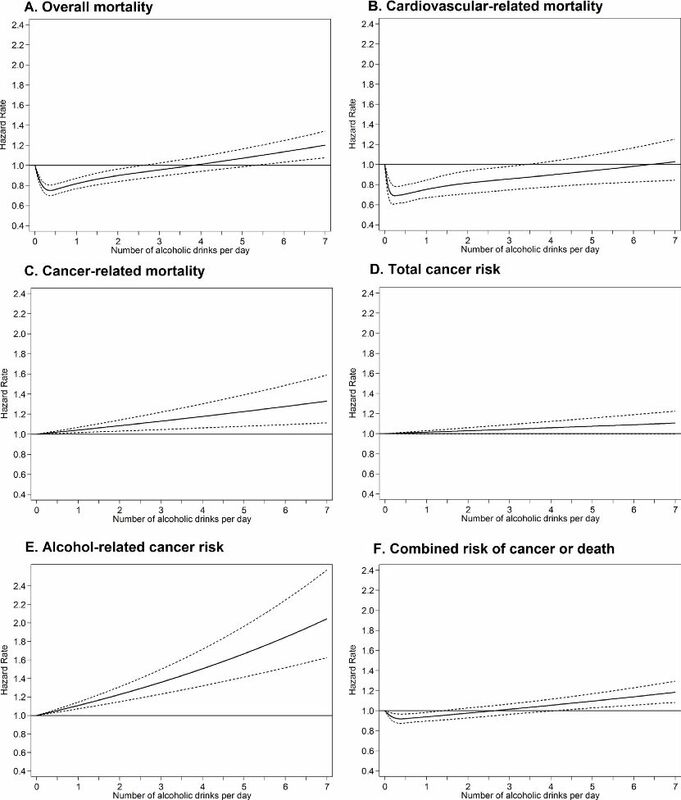 While everyone agrees that large amounts of alcohol contribute to the risk of many cancers, some scientists continually return to the finding that ‘even light drinking may increase the risk of breast cancer.’ Consuming of as low as 1 drink per day has shown evidence of an increase in the risk of breast cancer in most studies, although factoring in the intake of folate, binge drinking, concurrent use of hormone replacement therapy, etc. tend to significantly lower the risk.” It is interesting that a number of large studies indicate that mortality from breast cancer does not appear to be increased for light-to-moderate drinkers and may be associated with a reduction in deaths due to CVD as well as overall mortality. The median age for developing breast cancer is 62 with the highest incidence in women older than 70. Women in this age group are most susceptible to CVD. ISFAR members agreed that considering overall health and mortality is necessary when providing advice regarding alcohol consumption; as long as the intake is light, the net health effects are almost all positive. Women who do not binge drink, have an adequate intake of folate and are not on hormone-replacement therapy, the risk of breast cancer appears to increase only for consumers of more than one and a half drinks per day. There are special concerns for women regarding drinking. Nature has been unfair and has not designed women for drinking as much as the male. Women weight less than men on average and have more body fat. Fat has a poor blood supply so alcohol is rapidly distributed to organs where it produces the effects of drunkenness. They have half as much alcohol dehydrogenase (ADH) per unit body mass in the stomach. After menopause, women begin to develop a distribution of ADH between the liver and stomach that is more similar to men so they can drink more as a result. University of Rochester research in mice reported in Scientific Reports in February 2018 showed that low alcohol consumption (about 2.5 drinks per day) reduces inflammation in the brain and helps the brain clear away toxins, including those associated with Alzheimer’s disease (AD). The clearing process in the brain is the glymphatic system. This study may explain why previous research has shown that low-to-moderate alcohol intake is associated with a lower risk of dementia, while heavy drinking for many years leads to an increased risk of dementia. A systematic search of 20 systematic reviews published from January 2000 to October 2017 relating alcohol intake at various time periods to the incidence of cognitive impairment and dementia was pre-published in January 2019 in Alzheimer’s Research & Therapy. The authors reported that light-to-moderate alcohol use in middle to late adulthood was associated with a decreased risk of cognitive impairment and dementia, but heavy alcohol use was associated with changes in brain structures, cognitive impairments, and an increased risk of all types of dementia. The ISFAR critique considered this a well-done analysis but recommended further evaluation to understand the reasons and mechanisms that lead to these associations. A study of alcohol consumption and the risk of dementia was published in the British Medical Journal in August 2018. The study involved a 23-year follow-up of the Whitehall II cohort study on alcohol and dementia. The results indicate there is a link between moderate drinking during midlife and a lower chance of developing dementia later on. The group that abstained from alcohol and the group that drank in excess of 14 units per week were both shown to be at a higher risk of developing dementia than participants who drank between 1 and 14 units per week. Those in the 1 to 14 units-per-week group tended to drink wine and those who consumed more than 14 units per week drank more beer. 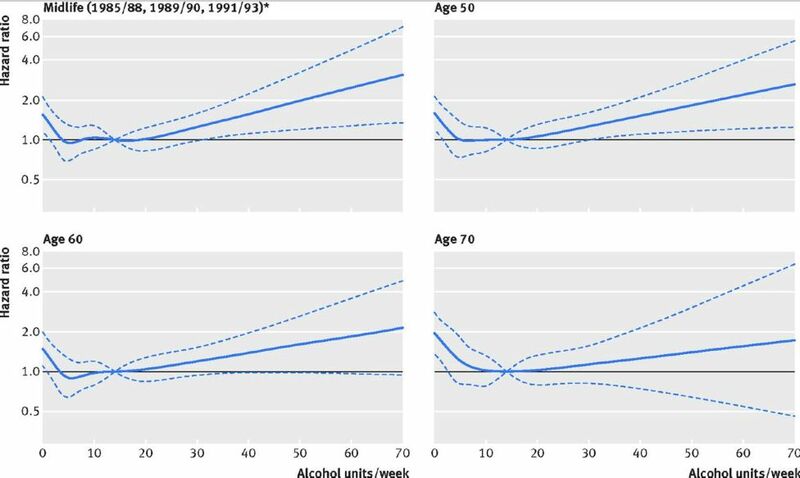 The charts below show the association between alcohol consumption per week and the risk of dementia by age (dotted lines are 95% confidence intervals). The data showed that abstainers had a higher prevalence of stroke, coronary artery disease, atrial fibrillation, heart failure and diabetes mellitus. The ISFAR critique pointed out that this was a well-done study but was based on self-reporting. The abstainer category was broad and included people that have drunk considerably before the study began and those who occasionally drank. As an observational study, no direct cause-and-effect link between drinking and dementia can be inferred. There is no data presented that permits an estimate of the level of intake where the risk of dementia exceeds that of non-drinkers. Conclusion: in terms of the risk of dementia as well as CVD, middle-aged and older individuals who are consuming alcohol moderately and without binge drinking should not be advised to stop drinking. A review article that appeared in Beverages Journal in 2018 by researcher Paula Silva reported on the neuroprotective abilities of the wine polyphenols in correlation to the pathophysiological mechanisms involved in AD. The conclusion was that moderate consumption of wine is one of the main factors behind the neuroprotective effects observed in some populations, and is due to a combination of neuroprotective effects of wine phenolic compounds.This paper included a chart of total phenols in mg/L of young white wine - 209.5, aged white wine - 285.2, young red wine - 1,732, and aged red wine 1,742. The varietals were not specified. Several case-control studies have suggested that alcohol consumption may be a protective factor for Parkinson’s Disease (PD). A meta-analysis published in the Journal of Neurology in August 2018 suggested a protective effect between moderate alcohol consumption and PD, which is supported by the results of case-control studies but not clearly by prospective ones. The Centers for Disease Control and Prevention (CDC) reports that about one in ten pregnant women in the U.S. ages 18-44 reports having at least one alcoholic beverage in the past 30 days while pregnant. The numbers of alcohol use during pregnancy are higher in other countries - between 40% and 80% in the United Kingdom, Australia and New Zealand. A survey of 1,032 people conducted by Cameron Hughes Wine and reported in the July 2018 issue of Women’s Health found that 35% of people think it is ok to drink while pregnant and 65% said you should never drink during pregnancy. The American Academy of Pediatrics, the American College of Obstetricians and Gynecologists, and the National Institute on Alcohol Abuse and Alcoholism including the CDC recommend that women avoid drinking completely if they are pregnant, or if they are not using birth control and there is any chance they might be pregnant. No amount of alcohol during pregnancy should be considered safe as a safe level has not been determined. There are studies that suggest light drinking might not be harmful to the baby but women may have different susceptibilities. A Spanish study reported in Alcohol in March 2018 used maternal hair testing to disclose self-misreporting in drinking and smoking behavior during pregnancy. 35.3% of participants did not drink alcohol at any point during pregnancy, 62.7% of participants consumed repeated moderate amounts of alcohol during pregnancy, and 2% consumed repeated consumption of heavy amounts of alcohol during pregnancy. Conclusion: close to two-thirds of pregnant women in this study drank some amount of alcohol during pregnancy, while only 3% admitted to drinking alcohol during pregnancy. The prevalence of the Fetal Alcohol Spectrum Disorder (FASD) in four U.S. communities was reported in JAMA in 2018. 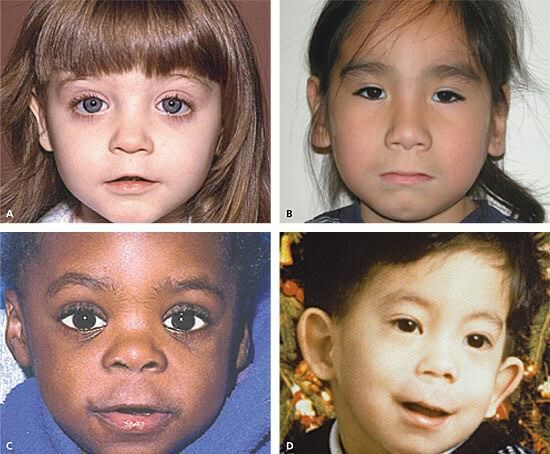 FASD is a group of postnatal conditions, first recognized in 1975, that may include abnormal growth and facial features (see photos below), intellectual disabilities and behavioral problems. Alcohol is known to be a teratogen that can cause birth defects. This study estimated that up to 1 in 20 kids in the communities studied fall somewhere on the spectrum of disorders caused by maternal drinking. This was a conservative estimate but could be as many as 1 in 10 (the commonly accepted estimate is 1 in 100). The disorders can be hard to recognize so the incidence of the problem is underestimated and are more common than previously thought. More women are consuming alcohol during pregnancy than previously thought at least in some communities. The criticism of this study is that the prevalence may have been overestimated and underestimated in different ways due to how the data was collected. More research is needed. 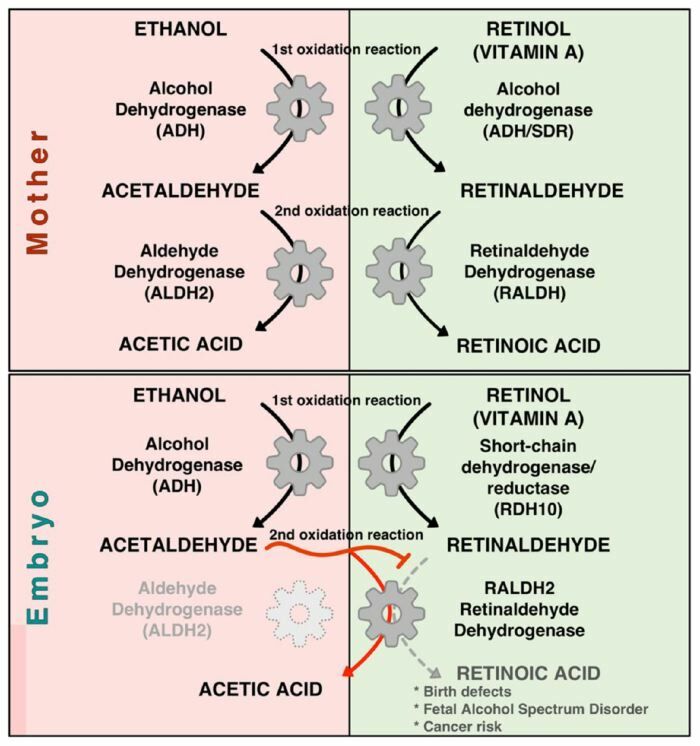 Biochemical and developmental evidence was provided in Scientific Reports in January 2018 showing that acetaldehyde, the metabolic byproduct of ethanol metabolism, inhibits retinoic acid biosynthesis to mediate alcohol teratogenicity in embryos. This research provided evidence that acetaldehyde is the teratogenic derivative of ethanol responsible for developmental malformations characteristic of the FASD. Refer to the chart below. A study published in October 2018 in Clinical & Experimental Research associated daily drinking with increased mortality. Two data sets with self-reporting use and mortality follow-up were analyzed from the National Health Interview Survey (NHIS). 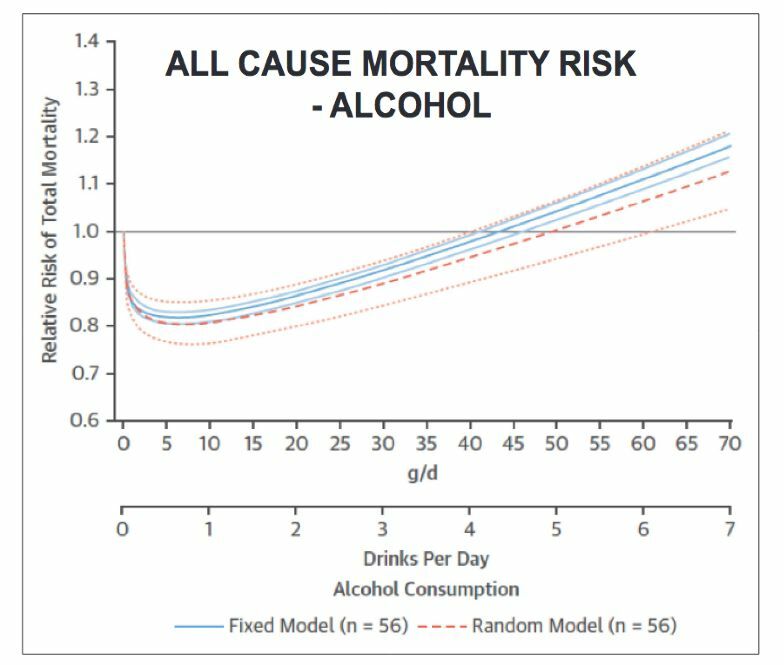 The minimum risk of low-level drinking frequency for all-cause mortality appeared to be approximately 3 occasions weekly. The authors of this study concluded that daily drinking, even at low levels, is detrimental to one’s health. There were several articles in the press in 2018 about the effects of wine and teeth staining, enamel erosion, cavities and more. Known as “wine teeth” or “wine mouth,” staining of the teeth can be due to red or white wine since white wine has more acidity and more tendency to break down enamel, leaving teeth more vulnerable to pigmented food and drinks. The vulnerability to tooth staining is variable and determined by the health of one’s teeth enamel. Good teeth hygiene is important since plaque can cause more teeth staining. Drinking white wine before red wine can worsen teeth staining. Red wines like Cabernet Sauvignon, Merlot and Malbec have more pigment, more tannin and produce more staining, while Pinot Noir produces less. One article in Seven Fifty Daily in 2018 revealed how drink professionals practice good dental hygiene. They recommend minimizing contact time between teeth and wine by rinsing with water soon after consuming. Swishing with water can remove potential stains, restore normal pH in the mouth and stimulate the flow of saliva. Strips of damp paper towels can be used to wipe off stains on the teeth. A tongue scraper can be used to improve taste sensation and reduce the loss of sensitivity of taste buds over time. Chewing xylitol gum can lower acid in the mouth and stimulate saliva production, and thereby can help prevent erosion. Some recommend remineralizing kinds of toothpaste and fluoride treatment every six months. Brushing should be avoided for at least 30 minutes after the last taste of wine because it can push acid into the teeth and cause more damage. High sugar wines such as some bottlings of Prosecco can lead to tooth decay. the combination of acid, sugar and alcohol can produce the “Prosecco smile,” seen as teeth coming out of the gum starting with a white line just below the gum that is the beginning of tooth decay. Most scientific research on the health benefits of wine has focused on the polyphenols that include resveratrol, quercetin, anthocyanins, procyanidins, ellagic acid and catechins. 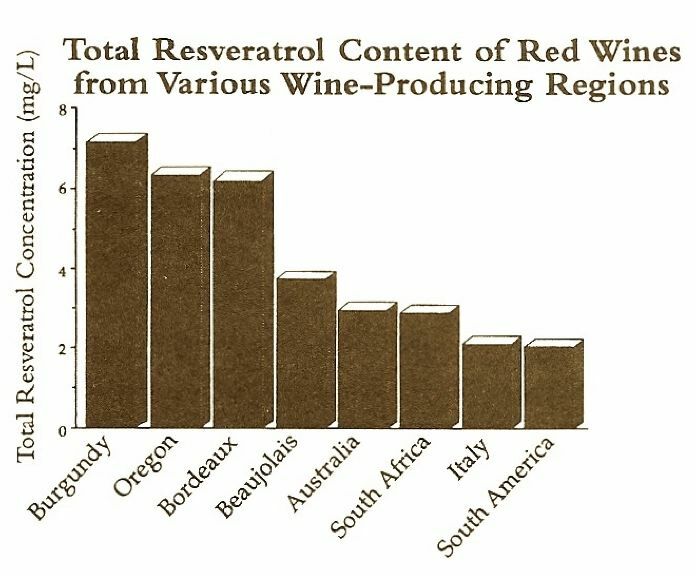 Cornell scientist Leroy Creasy first isolated resveratrol from red wines in 1991 and later theorized that resveratrol was at least partly responsible for red wine’s health benefits. This led to a plethora of research studies. Resveratrol became the most investigated polyphenol and was termed the “polyphenol most likely to succeed.” Resveratrol has been shown to slow or inhibit cancer cell growth, lower bad cholesterol (LDL) and raise good cholesterol (HDL), prevent blood vessel damage, slow progression of Alzheimer’s and help regulate insulin to prevent type 2 diabetes mellitus. Unfortunately, there does not appear to be enough resveratrol in wine to have a significant effect. Polyphenols are antioxidants found in the skin of red grapes, red wine, tea, cacao, dark chocolate, peanuts and blueberries. They are antioxidative because they have a catechol group on the aromatic ring that attracts oxygen-free radicals. The human body’s biochemical pathways result in waste products such as free radicals. The free radicals are considered the body’s terrorists because they attach to a molecule with an unpaired electron, a process called oxidation. When free radicals interact with DNA in cells or the cell membrane, the cells may function poorly or die causing diseases of aging such as vascular disease, cancer, dementia and diabetes. Polyphenols are also anti-inflammatory and can inhibit or prevent tumor growth. Red wines that are dark in color and high in tannins have higher polyphenol content such as Tannat, Petite Sirah, Nebbiolo, and Cabernet Sauvignon. Although Pinot Noir is a thin-skinned grape, it has among the highest levels of polyphenols of all red grapes. the polyphenol content of red wines will vary depending on where the grape is grown, how the wine is made, and how old the wine is with more polyphenols in younger wines. A study in STAT News in September 2018 reported that resveratrol and quercetin, two antioxidants found in red wine, are being incorporated into heart stents being developed at REQuisite Biomedical to keep blood vessels from narrowing again after insertion in coronary angioplasty. The new stent releases red wine antioxidants that work by preventing blood clotting and inflammation. The company is also developing a balloon with the two antioxidants in red wine coated on it to treat peripheral artery disease. A Spanish research team reported in the Journal of Agricultural and Food Chemistry in 2018 that polyphenols in wine can fend off harmful bacteria in the mouth and play a role in fighting tooth decay and gum disease. 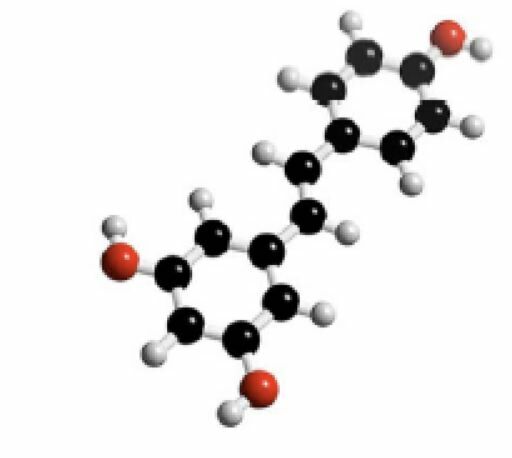 The researchers found two polyphenols in red wine, p-coumaric and caffeic acid, that reduced bacteria’s ability to stick to the gum cells in the mouth when used alone or combined with an oral probiotic. Swiss scientists have developed a nasal spray containing resveratrol that is administered via an asthma-styled inhaler. It was shown to decrease by 45 percent the formation of tumors in mice exposed to a cancer-causing compound from cigarette smoke. This spray may also work in humans as a preventative against lung cancer, the deadliest form of cancer. The concentration of resveratrol in the lungs after nasal spray administration was 22 times higher than when taken orally. It is possible that resveratrol may be administered through electronic cigarette smoking as well as resveratrol is highly soluble in e-cig fluid. This study was published in / September 2018 in the journal Scientific Reports. Scientists at Al-Rafidain University College in Baghdad found that patients with osteoarthritis given a resveratrol compound reported less pain and reduced inflammation in their knees. Published in the Journal of Medicinal Food in December 2018, orally administered resveratrol as an adjuvant with meloxicam appeared to be an effective treatment of patients with mild to moderate knee osteoarthritis. Research reported in BMC Cell Biology in October 2017 revealed that resveratrol analogues applied to cells in culture rejuvenated the cells quickly. Splicing factors that are turned off as we age can be turned back on in the compound-soaked cells. It was theorized that using chemicals to switch back on the major class of genes that are switched off as we age might provide a means to restore function to old cells. Binge drinking is also referred to as “heavy episodic drinking,” and is defined in several different ways. It is also interchangeable with the terms “excessive” and “heavy” drinking. The National Institute on Alcohol Abuse and Alcoholism defines binge drinking as a pattern of drinking that brings blood concentration (BAC) levels to 0.08 g/dL which is also the legal limit for driving in most states. Another accepted definition of binge drinking is drinking five or more drinks for men and four for women on the same occasion on at least one day in the past 30 days. A variation of this definition is the consumption of five or more drinks by men and four or more drinks by women in a two-hour span. Regardless of how you define binge drinking, it is clearly hazardous to your health. At least part of the motivation to binge drink is thought to be the release of dopamine in the brain by alcohol. This neurotransmitter produces rewarding pleasurable effects and motivates the drinker to binge over and over. 1. Binge drinking is not healthy at any age. 2. Binge drinking is particularly risky for high school and college-age girls in whom this activity can lead to an increased risk of breast cancer in later life. 3. Any health benefits from light-to-moderate alcohol intake disappear with regular binge drinking. 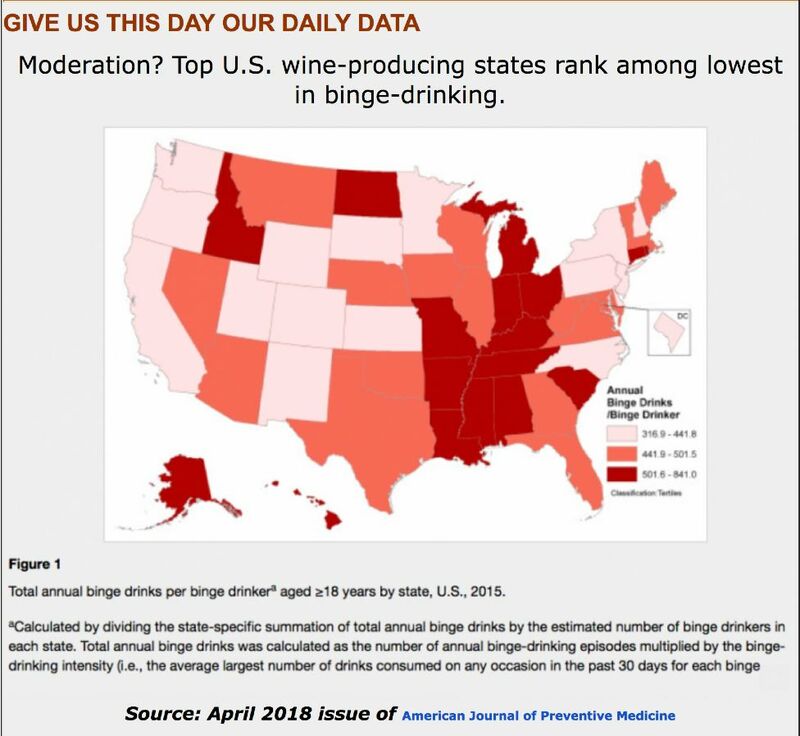 The frequency of binge drinking varies by states in the U.S. and is lowest in the wine-producing states. This report was published in the April 2018 issue of the American Journal of Preventive Medicine. A paper in the Journal of Neuroscience published in July 2018 by Columbia University scientists looked at how binge drinking alters the activity of the neurons in the prefrontal cortex, the part of the brain where short-term and working memories are located. Mice who chose to binge drink dampened the activity of neurons in this region of the brain. 90 percent of teen drinking is binge drinking and this is unfortunate since the prefrontal cortex is not entirely functional until the 20s and could lead to long-term memory issues with aging. New research published in the American Journal of Preventive Medicine in April 2018 revealed that U.S. adults consume 17.5 billion binge drinks per year. This study, conducted by researchers at the CDC, found that one in six Americans drinks about once a week at an average of about seven drinks per binging session. Binge drinking is most common among young adults between the ages of 18 and 34, but more than half of all binge drinks consumed were by adults over age 35 (the biggest bingers). 29 cohorts of U.S. young adults were studied in a report published in Alcoholism: Clinical & Experimental Research in January 2019. The age of peak binge drinking prevalence increased across cohorts from age 20 in 1976 to 1985 to 22 in 1996-2004 for women, and from 21 in 1976-1985 to 23 in 1996-2004 for men. Women in the more recent cohort group ages 21 to 30 reported significantly higher binge drinking prevalence than women in earlier cohorts. Men in the more recent cohort group reported higher binge drinking prevalence at ages 25 to 26. The conclusion was that an older age of peak binge drinking and a decreased rate of decline in the prevalence of binge drinking in later young adulthood among more recent cohorts have resulted in an extension of individual and societal risk associated with binge drinking, particularly for women, across young adulthood. On December 30, 2018, Utah became the first state to lower the legal standard for driving under the influence from the nationally recognized .08 to .05. The National Transportation Safety Board advocated for a lower threshold in 2013, but the alcohol industry has been firm in their opposition. A spokesman for the American Beverage Institute said, “.05 will do little to save lives while criminalizing what is now considered perfectly responsible behavior. 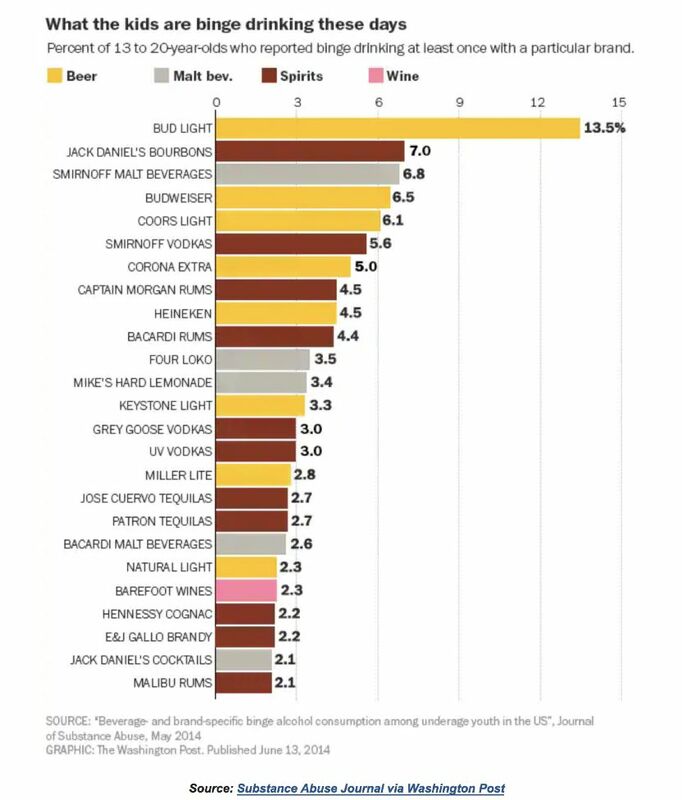 At that very low level, impairment isn’t even meaningful.” BAC charts report that it takes three drinks in one hour for a 16-pound man to reach .05 (some claim two drinks), while a 120-pound woman would reach .05 after one or two drinks, depending on the chart. California lawmakers are considering bill AB 1713 that would reduce the amount of alcohol you can legally have in year system while driving from a BAC of .08 percent to .05 percent. Commercial drivers in California are already held to the .05 standard. A government-funded pilot program in Whitehorse, Canada. initiated red and yellow cancer warnings on labels of bottles of wine and spirits late in 2018. “Alcohol can cause cancer” read the labels. In Ireland, in August 2018, the government-funded charity Alcohol Action announced plans to include health warnings on alcohol products that link drinking to a higher risk of developing diseases and health conditions. In October, a law requiring alcoholic drinks be labelled with cancer warnings passed. The law also restricts advertising of drinks and requires labels to state the number of calories. The United Kingdom Royal Society for Public Health called for cancer warnings to be included on alcohol labels in Britain. In September 2018 Drink Free Days was launched by Public Health England and Drinkaware. Middle-aged drinkers (45-65) are being told to abstain from alcohol at least two days per week. This initiative is aimed at curbing health risks later in life by drinking less. Renowned Harvard University geneticist David Sinclair has re-surfaced after he promoted resveratrol as a wonder molecule that could reverse aging back in 2004 when he co-founded Sirtris, a company to test resveratrol’s possible anti-aging benefits. The company was sold in 2008 to GlaxoSmithKline but Glaxo stopped research in 2010 because of poor results and possible toxicity. Sinclair, though, pocketed $8 million from the sale of Sirtris. Sinclair has now boasted online that by taking resveratrol, the diabetes drug metformin, and a NAD booster known as nicotinamide riboside, he has the lung capacity, cholesterol and blood pressure of someone two decades younger than his 49 years. Blood tests that calculate biological age determined by the company InsideTracker indicated he was 58 years old. Sinclair’s research, which has spurred his claims, has only been performed on mice. You can’t always believe what you read, even peer-reviewed scientific research published in prestigious medical journals. A 2013 study published in the New England Journal of Medicine found that people eating the Mediterranean diet (MD) supplemented with olive oil were 30 percent less likely to experience a heart attack, stroke or death from CVD than people assigned a low-fat diet. Those who stuck to the Mediterranean diet supplemented with mixed nuts had a 28 percent lower risk than those asked to follow a low-fat diet. In June 2018 the New England Journal of Medicine retracted the paper because the subjects were not properly randomized. A corrected version of the paper shows people following the MD had a similarly reduced level of heart attacks and strokes but the diet was not the direct cause of those health benefits. The MD was named the best for 2019 in a report of rankings published by US News and World Report in January. The MD was also named the best diet for healthy eating, best plant-based diet, best diet for diabetes, and easiest diet to follow. Numerous studies have suggested that the MD can reduce the risk for diabetes, dementia, memory loss, depression, breast cancer, heart disease, and osteoporosis, and increase longevity. The MD includes red wine in moderation and enjoying meals with others. ‘Wine in Moderation’ is celebrating 10 years of social responsibility in the wine sector. In 2008, the European wine sector took the step to address alcohol-related harm and created the Wine in Moderation Program. The program brought together an alliance of businesses, universities, authorities and citizens from around the world. Wine in Moderation’s policy statement: “We raise awareness and knowledge about conscious enjoyment. We help people to appreciate wine culture and enjoy wine in a healthy, sustainable and convivial way.” The program recommends drinking wine slowly, accompanying wine with good food alongside a glass of water, appreciate with good company, friends and family, and be sensible by avoiding excess. Wine in Moderation is now active in 17 countries on 2 continents. Visit the website at www.wineinmoderation.eu. International Scientific Forum on Alcohol Research (ISFAR) - www.alcoholresearchforum.org.